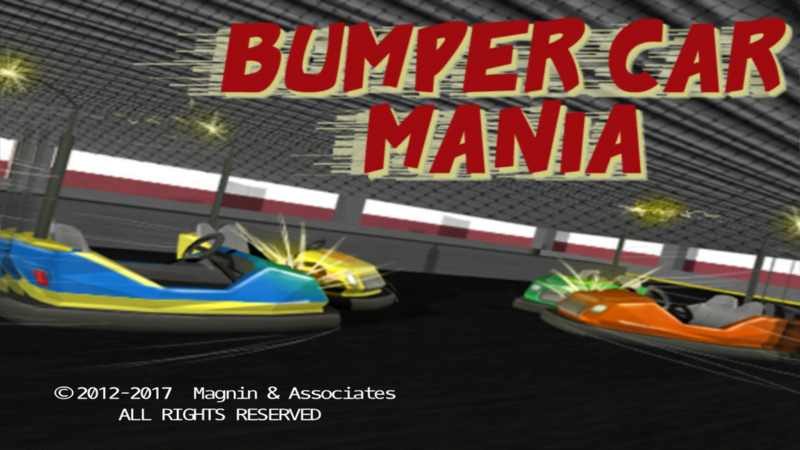 [prMac.com] Farmers Branch, Texas - Magnin & Associates today is proud to announce the release of Bumper Car Mania 2.1, an update to their popular game title on iOS, Android, and Windows 10. Bumper Car Mania lets you enjoy the thrill of bumper cars on your phone, tablet or PC. Just lean the phone to speed up, slow down, backup, and steer. Phones vibrates on "impact" on devices which support it. On Windows 10 PC, can use Xbox One controller or simple keyboard commands. The game was produced by Ed Magnin, programmed by Willie Johnson, Jr, with graphics by Joe Eisma. Matt Campana created the excellent audio effects. According to Ed Magnin, "This release is part of our strategy of adding multi-platform support to our multiplayer games. Just because you have an iPhone and your friend has an Android or a PC, doesn't mean you shouldn't be able to play together." Bumper Car Mania 2.1 is $1.99 USD (or equivalent amount in other currencies) and available worldwide through the App Store in the Games category. An Android version is available worldwide from Google Play and the Amazon App Store. A Widows 10 PC version is available from the Windows Store. (A single player version is also available for the Apple TV, and is a Free download to previous purchasers of the iOS version.) For more information, please contact Ed Magnin. Ed Magnin has been actively involved in the game industry since 1979. Earlier in his career he worked for some of the top game developers of their day - MicroProse, Cinemaware, Virgin Games, and Park Place Productions. In 1993, he founded Magnin & Associates and has focused on handheld games ever since. For the last 6 years they have created over 25 for the iOS (with over a million App Store downloads), 18 for Android, and 16 for Windows. All Material and Software (C) Copyright 2017 Magnin & Associates. All Rights Reserved. Apple, the Apple logo, iPhone, iPod and iPad are registered trademarks of Apple Inc. in the U.S. and/or other countries. Other trademarks and registered trademarks may be the property of their respective owners.